Leslie Albert Fisher was born in Norfolk and arrived in Chelmsford by 1911. 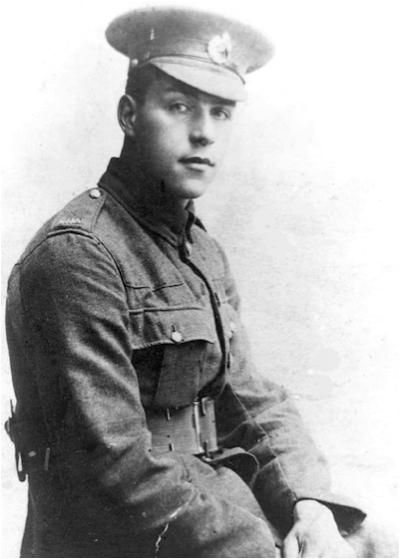 He worked for Christy Brothers, joined the Territorials, transferred to the Regulars and arrived in France in July 1915. He died from wounds two months later. His family home was in Chelmsford’s High Street where his father managed a shop. A cousin was also killed during the war. The photograph was taken around 1911 in the garden behind 48 High Street, Chelmsford, and it was there that census of 1911 recorded Leslie, his parents and five surviving siblings - the site is today part of ‘The Meadows’ shopping centre. Leslie worked in electrical engineering for Christy Brothers in Broomfield Road, Chelmsford. His father was a shop manager for a dealer in musical instruments - Messrs. Nelson, Murdoch, and Co. whose shop was at 48 High Street. Leslie enlisted at Chelmsford in September 1914, and with his electrical engineering background served with the Royal Engineers, He landed in France July 1915 as part of the 20th (Light) Division. He died from wounds on 14th September 1915 while serving as Sapper 49941 in the 83rd Field Company. He was aged 19. He is buried at Merville Communal Cemetery, twenty kilometres south-west of Armentieres in Nord, France (grave: IV. B. 5). Leslie is commemorated on the Civic Centre Memorial, Chelmsford. He was entitled to the 1914-15 Star, British War Medal, and Victory Medal. Leslie’s cousin, Thomas Donald Fisher, also lost his life during the war, killed in action in 1917. His parents continued to live at 48 High Street after the war and a 1920 street directory listed Leslie’s father there and manager of Nelson Murdoch and Company. He was still managing the shop at the outbreak of the Second World War, evidenced by the fact that in October 1939 he was fined five shillings for a breach of the blackout regulations. Leslie’s sister, Florence Annie, became an opera singer and married Edward Claude Cousens. He saw service in the First World War in the Royal Naval Reserve and Royal Flying Corps and Royal Air Force. During the Second World War he joined the army as an intelligence officer and worked at the Government Code and Cipher School, Bletchley Park where he was Head of Hut 3 Liaison Party for Hut 6 Intercept Control Section. Photographs courtesy of Mike Fisher. Leslie was born at Foulsham, Norfolk in 1896, the eldest child of George Fisher and Annie Matilda Fisher (nee Skidmore). Leslie’s father has been born in 1869 in Mattishall, Norfolk; his mother c1869 in Eastleach, Gloucestershire. They had married on 3rd June 1895 in Oxfordshire. His seven siblings included Millicent Mary Fisher (born in 1897 at Foulsham, died 1969), Florence Annie Fisher (born in 1898 in Foulsham, died in 1994), Harold George Fisher (born in 1899 in Foulsham, died 1901), Ivy Helen Fisher (born in 1902 in Norwich, Norfolk), Thomas George Fisher (born in Peterborough, in 1905, died 1999) and Bertram Jack Fisher (born 1906 in Hertford, Hertfordshire, died 1972). Harold and one other sibling were to die by 1911. Norwich. Norfolk. Leslie’s father was a furnishes and drapery salesman. The photograph above shows Leslie, his parents and siblings. Leslie is stood in the centre flanked by his sisters Florence Annie (stood on his right) and Millicent Mary (stood on his left). 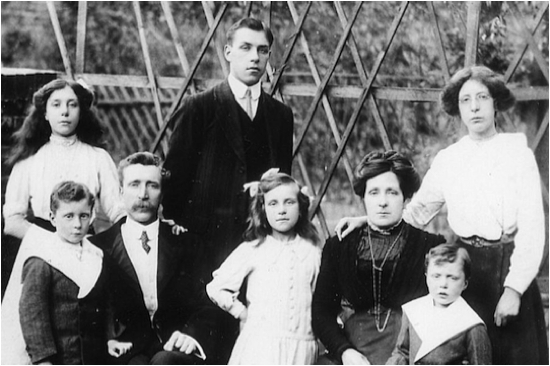 In the front, left to right are, his brother Thomas George (‘Tom’), his father George, his sister Ivy Helen, his mother Annie Matilda and brother Bertram Jack (‘Pickles’).